KEF Reference and Blade II speakers make their US debut | What Hi-Fi? 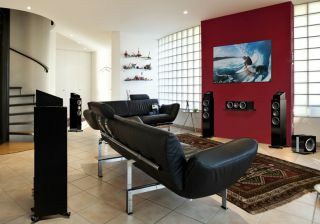 KEF gave visitors to the CEDIA Expo in Denver their first glimpse of the firm's new Reference and Blade II speakers, with the official US launch to follow in two weeks at the New York Audio Show. We were lucky enough to see the full Reference range and the "mini Blades" earlier this year at the Munich High End Show, but this is their first outing Stateside. Also on show for the first time in the US was KEF's new R50 Dolby Atmos speaker module that we wrote about earlier this month. The company is further expanding its range of Dolby Atmos speakers with the introduction of the in-ceiling Ci series, comprising the Ci200RR-THX, Ci200QR and Ci160QR. In addition, KEF showed off its Extreme Theatre in-wall speaker system (pictured above). This includes two THX Ultra2 certified in-wall speakers (the Ci5160RL-THX and Ci3160RL-THX), combined with a single Ci200RR-THX in-ceiling speaker and an in-wall subwoofer.